I can now also provide a list of every candidate for the state election that I know of. Thanks to Nick Casmirri for doing much of the work finding candidates. The list will continue to expand until nominations close in early March. There are still a number of sitting MPs who haven’t made it entirely clear if they are running for re-election, but probably are. 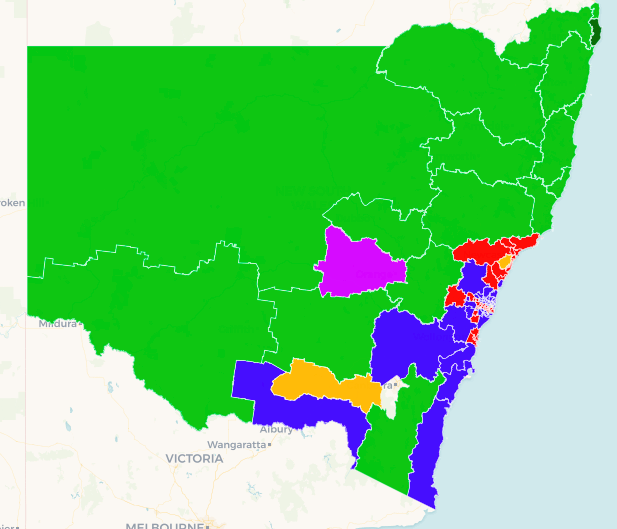 So far we have identified 84 Labor candidates, 46 Greens candidates and a combined total of 54 candidates for the Coalition. The Shooters, Fishers and Farmers, who generally did not run candidates for lower house seats until by-elections in the current term, have announced 18 candidates. You can view the candidate list here. You can also view the latest version of the federal election candidates list. I will periodically update the candidate lists on each seat guide. If there is a missing candidate, or a website address for a candidate, please email it to me or post it in the comments and it will be updated the next time I clear the backlog. You can also browse through this map and click on any seat to see the margin and a link to that seat’s profile.